Nouriel Roubini, Professor of Economics at the Stern School of Business, New York University and co-author of the book Crisis Economics, was one of the only economists who recognized the housing bubble and predicted the Great Recession. The global economy, artificially boosted since the recession of 2008-2009 by massive monetary and fiscal stimulus and financial bailouts, is headed towards a sharp slowdown this year as the effect of these measures wanes. Worse yet, the fundamental excesses that fueled the crisis – too much debt and leverage in the private sector (households, banks and other financial institutions, and even much of the corporate sector) – have not been addressed. Private-sector deleveraging has barely begun. Moreover, there is now massive re-leveraging of the public sector in advanced economies, with huge budget deficits and public-debt accumulation driven by automatic stabilizers, counter-cyclical Keynesian fiscal stimulus, and the immense costs of socializing the financial system’s losses. The global slowdown – already evident in second-quarter data for 2010 – will accelerate in the second half of the year. Fiscal stimulus will disappear as austerity programs take hold in most countries. Inventory adjustments, which boosted growth for a few quarters, will run their course. The effects of tax policies that stole demand from the future – such as incentives for buyers of cars and homes – will diminish as programs expire. Labor-market conditions remain weak, with little job creation and a spreading sense of malaise among consumers. The likely scenario for advanced economies is a mediocre U-shaped recovery, even if we avoid a W-shaped double dip. In the US, annual growth was already below trend in the first half of 2010 (2.7% in the first quarter and estimated at a mediocre 2.2% in April-June). Growth is set to slow further, to 1.5% in the second half of this year and into 2011. Whatever letter of the alphabet US economic performance ultimately resembles, what is coming will feel like a recession. Would you ask this man for his papers? Economist asks if for-profit colleges are "monsters in the making?" IT SEEMS too good to be true, at least for companies. Customers arrive at for-profit colleges by the million. With them comes billions of dollars of federal student grants and loans, to be poured into corporate coffers. Public subsidies may provide up to 90% of revenue; the government bears the risk of loan defaults. This business model has served firms rather well. Its effect on students and taxpayers is less clear. This summer, however, a brawl over for-profit colleges has exploded at last. On May 26th Steven Eisman, a big shorter, warned investors that for-profit colleges could echo subprime mortgages. June brought a Senate hearing (including testimony from Mr Eisman, to the industry’s horror) and proposed regulations from the Education Department. As The Economist went to press the department was expected to release another, even more controversial rule. Behind this fight lies a new, rather uncomfortable urgency. For-profit colleges have happily depended on government support. Now education may increasingly come to depend on for-profit colleges. Proprietary colleges have morphed into behemoths, some of them publicly traded companies that reach hundreds of thousands of students in classrooms and online. Enrolment jumped by 225% between 1998 to 2008, more than seven times the rate for all post-secondary programmes. The recession has accelerated this trend. The Apollo Group’s University of Phoenix, the biggest proprietary college, now enrolls 476,500 students. With more students comes more public money. In 2008-09 $24 billion in Pell grants and federal loans went to for-profit colleges. The return on investment is harder to calculate. The industry is shrouded in fuzzy numbers. Reliable graduation rates and earnings data do not exist. More certain, however, is that the debt burden and default rates for graduates are particularly high. In 2009 the average yearly tuition was about $14,000, compared with $2,500 at a community college. Critics claim that misleading recruiting lures students into programmes that leave them with heavy debt and flimsy skills. Of post-secondary investigations by the Education Department, 70% are related to proprietary schools. Litigation is common. In 2009 Apollo agreed to pay $78.5m to settle a suit over pay schemes for recruiters. The Education Department is trying to fix these problems. It has proposed requiring schools to give more information about fees, graduation rates and job placement. Schools would not be able to tie recruiters’ pay to their enrolment numbers. The most controversial idea, to cap students’ yearly debt obligations to a small share of income after graduation, will be formally proposed any day now. Harris Miller of the Career College Association contends that such a change would force thousands of good programmes to shut. Final regulations are expected by November. Further legislation may come from Tom Harkin, who is leading Senate hearings on the industry. Changes are needed—and soon—not merely to protect students and taxpayers. For despite all the criticism, proprietary colleges look likely to become ever more necessary. Barack Obama has set a goal of having the world’s highest share of college graduates by 2020. Proprietary schools offer flexible classes for those with jobs, children or remote homes. More important, community colleges are severely strained. Though federal student aid has risen, a plan to support community colleges was all but gutted in March. States are overwhelmed by growing demand and shrinking budgets. California estimates that tight capacity forced community colleges to turn away 140,000 students this year. It is no coincidence that Kaplan, a for-profit college, has signed a controversial agreement to tap the state’s glut of students. Mr Miller is defiant. “No one wants to talk about how the capacity expansion has to come from somewhere,” he says. In 2008 for-profit colleges accounted for 7.7% of all post-secondary enrolment. For better or worse, that share is likely to grow. Yesterday, the United States Senate finally mustered the 60 votes required to extend unemployment (UC) benefits to the 2.1 million Americans who had run out them. This vote tells you all you need to know about the priorities of the Republicans who almost unanimously opposed providing the extension. 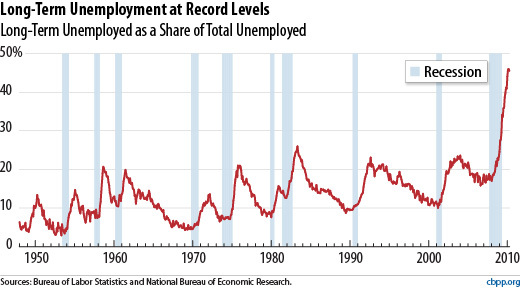 Fifteen million Americans are officially unemployed. If you include those who have dropped out of the labor market and involuntary part-time workers, the number soars to 23 million. 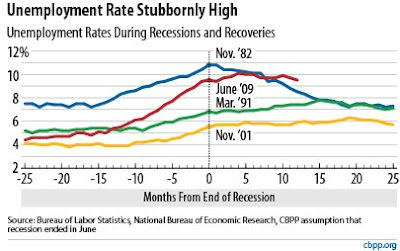 Almost half, a record number, are considered long-term unemployed, having been out of work for six months or more. There are currently more than five people looking for work for every job opening. But the Republican Senate leadership and all but two Republican Senators voted against extending unemployment benefits to the nation’s 2.1 million unemployed workers who had exhausted their benefits. Many, like Wisconsin Republican Senate candidate Ron Johnson, outrageously claim that providing the unemployed with benefits they have paid for and earned while working encourages them to remain unemployed. The Republican hypocrisy is breathtaking. While opposing the unemployment benefits extension as too expensive, they continue to push for legislation that would make the Bush era tax cuts, 50% of which went to the richest 1% of taxpayers, permanent. The cost of extending unemployment benefits is $34 billion dollars. The cost of extending the tax cuts, $3 trillion over the next ten years! The Bush tax cuts were originally sold as affordable because of a projected $5.4 trillion surplus. By the time they were passed in the spring of 2001, the rational had change. The $1.3 trillion tax cut was justified as the way to jump-start the economy that had plunged into recession in March 2001. The tax cuts proved a very ineffective form of stimulus since the main beneficiaries of the cuts, those averaging $900,000 a year, were reluctant to spend their windfall. Unemployment benefits, on the other hand, are one of the most effective forms of stimulus because the unemployed immediately spend the money they receive. That’s why unemployment benefits are called an automatic stabilizer. So the proposal to extend UC benefits is a twofer. It will help more than two million folks who have lost their jobs through no fault of their own and it will stimulate the struggling economy. But that’s not good enough for the Republicans. Claiming to be concerned about the deficit, they say we need to curtail spending that assists working and middle class Americans. Extending unemployment benefits, funding mine, food, toy inspections and Social Security are too just expensive they claim. In their world the nation simply cannot afford to regulate oil companies like BP, mining companies like Massey Energy and private banks like Goldman Sachs. But it is not to expensive to bail out banks, make upper income tax cuts permanent or maintain tax loopholes that allow hedge fund and private equity operators to pay tax rates at less than half the rate that working Americans pay and cost the nation $20 billion annually. All of us should remember this come November. While the constitutionality of Arizona's anti-immigrant legalisation, SB 1070, is being challenged in court, opponents of the law are intensifying efforts to convince Bud Selig, the Commissioner of Major League Baseball (MLB), to relocate the 20011 All Star game. Several prominent baseball players including the Brewers all star pitcher, Yovanni Gallardo, Adrian Gonzalez (San Diego) and Albert Pujols (St. Louis) have announced they will not participate in the 2001 All Star game as long as the law that institutionalizes racial profiling remains on the books. Presente, a Los Angeles based organization, has collected over 100,000 signatures on petitions urging Selig to "move the game." In the early 1990s the National Football League moved the Super Bowl out of Phoenix after the Arizona Legislature refused to honor Dr. Martin Luther King's birthday as a national holiday. Apartheid South Africa was also the target of successful athletic boycotts in the 1980s. Commissioner Selig can't have it both ways, celebrating MLB for signing Jackie Robinson and leading the fight against racial segregation while keeping the 2011 All Star game in Arizona, a state that persecutes Latinos. I recently returned from the AFT national convention. One of the highlights occurred when AFT President Randi Weingarten introduced the leaders of a group of Filipino teachers who had paid $15,000 to come teach in New Orleans and found themselves in the condition of indentured servants. The events demonstrate why unions are as relevant today as they were in the middle of the Twentieth Century when AFT 212 was formed. The story of these teachers and how AFT fought to free them is told in video below. In an op ed in the LA Times Senator Tom Harkin warns that massive defaults will result from for-profit colleges manipulating students into taking out loans that they cannot afford. Haven't we heard this story before? It features a high-pressure sales force persuading consumers in search of the American dream to go deep into debt to purchase a product of often dubious value. Default rates are sky high. Taxpayer money is squandered. Top executives walk away with fortunes. This sounds like a description of the subprime mortgage industry, which came crashing down two years ago. But what I just described is the reality at many for-profit colleges. ...serious questions have been raised about some of the major players in this rapidly growing industry. Critics charge that many for-profit colleges employ overly aggressive recruiting tactics targeting low-income students. Students take on excessive debt, and though dropout rates are not available, there is reason to believe that they are very high. Critics say that the entire business model, especially in the case of publicly traded companies, is premised on a college's ability to churn through many thousands of students, whose federal Pell grants of up to $5,550 and Stafford loans are paid to the school, with no accountability for student learning or graduation. Even good actors in this industry are lured into the vortex of bad practices in order to compete and meet investors' expectations. Yovani Gallardo is an All Star, the ace of the Brewers' staff. Today he proved he's an All Star outside the white lines when he unleashed a fastball at Arizona's new immigration law that institutionalizes racial profiling. ''If the game is in Arizona, I will totally boycott,'' the Milwaukee Brewers pitcher said Monday. A year before Phoenix is set to host baseball's big event, the state's new immigration law kept drawing the attention of major leaguers. Tampa Bay reliever Joakim Soria said he would support a Latino protest and stay away. Detroit closer Jose Valverde can see himself steering clear, too. ''If I do get chosen, I don't know what I'm going to do,'' he said. 27.7% of Major League Baseball players are Latino. Almost 50% of minor league ball players are. About three dozen protesters held signs Monday one block from the hotel where Major League Baseball held its welcoming news conferences. The demonstrators said they had over 100,000 petitions solicited by Change the Game asking commissioner Bud Selig to move the 2011 All-Star game out of Arizona. Another protest was planned outside Angel Stadium before Tuesday night's game. Selig has not spoken directly on the subject. Asked in May about calls to shift next year's game, he gave a defense of baseball's minority hiring record. Selig did not take questions at Monday's All-Star introductory event. Arizona's much-debated measure takes effect July 29. The statute requires police, while enforcing other laws, to ask about a person's immigration status if there is reasonable suspicion that the person is in the country illegally. The Mexican-born Gallardo said he's talked with Soria and All-Star first baseman Adrian Gonzalez about the Arizona law. Several All-Stars, proving they are anything but, avoided the topic. ''Wrong guy,'' teammate Alex Rodriguez who manipulated his way to the Yankees and the largest contract in Major League Baseball history, said, pointing to other players in the interview room. Los Angeles Dodgers shortstop Rafael Furcal said he would wait for guidance from the players' union. The union has already condemned the law and said that if it is not repealed or modified additional steps would be considered. Oakland closer Andrew Bailey, whose team holds spring training in Phoenix, said his sport was caught in a crossfire. Arizona's racial profiling law, SB 1070, is built on lies promoted by political opportunists like Arizona's Governor Jan Brewer and Senator John McCain who utilize fear as an effective political weapon. Hard working families who contribute to making all of our lives better are their unjust targets. Republican unite against the unemployed! 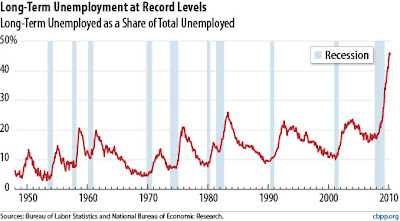 Before recessing for the July 4th weekend, the United States Senate failed to extend unemployment benefits for the nation's long term unemployed. As a result, 1.4 million unemployed workers have lost their only source of income. Every single Republican Senator and a handful of Democrats voted against the extension! This is the worse recession since the Great Depression. 15 million people are out of work. Almost half of the unemployed have been jobless for six months or more, the standard measure for long-term unemployment. Millions more are not even counted, having dropped out of the labor market entirely, 650,000 last month alone. Yet the Republican Party is united in opposing an extension of unemployment benefits because they fear that it will increase the deficit or even more insanely they believe that unemployment benefits undermine the unemployeds' incentive to work. This position is cruel particularly in light of the Republicans united opposition to legislation requiring billionaire hedge fund and private equity firm operators to pay federal income taxes at the same rates as other Americans. 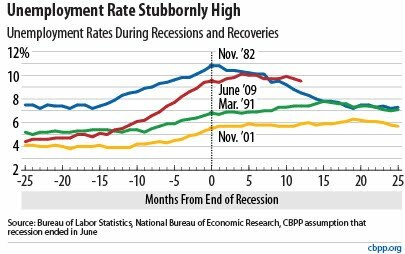 It is also bad economics since unemployment benefits are among the most effective forms of economic stimulus, something the slumping economy sorely needs. When the economy is booming, and lack of sufficient willing workers is limiting growth, generous unemployment benefits may keep employment lower than it would have been otherwise. But as you may have noticed, right now the economy isn’t booming — again, there are five unemployed workers for every job opening. Cutting off benefits to the unemployed will make them even more desperate for work — but they can’t take jobs that aren’t there. Wait: there’s more. One main reason there aren’t enough jobs right now is weak consumer demand. Helping the unemployed, by putting money in the pockets of people who badly need it, helps support consumer spending. That’s why the Congressional Budget Office rates aid to the unemployed as a highly cost-effective form of economic stimulus. And unlike, say, large infrastructure projects, aid to the unemployed creates jobs quickly — while allowing that aid to lapse, which is what is happening right now, is a recipe for even weaker job growth, not in the distant future but over the next few months. But won’t extending unemployment benefits worsen the budget deficit? Yes, slightly — but as I and others have been arguing at length, penny-pinching in the midst of a severely depressed economy is no way to deal with our long-run budget problems. And penny-pinching at the expense of the unemployed is cruel as well as misguided. So, is there any chance that these arguments will get through? Not, I fear, to Republicans: “It is difficult to get a man to understand something,” said Upton Sinclair, “when his salary” — or, in this case, his hope of retaking Congress — “depends upon his not understanding it.” But there are also centrist Democrats who have bought into the arguments against helping the unemployed. It’s up to them to step back, realize that they have been misled — and do the right thing by passing extended benefits. Independence Day: equality and inalienable rights! As we celebrate Independence Day, we should reflect on its history and meaning. It was on July 4, 1776 that members of the Second Continental Congress, meeting in Philadelphia, adopted the final draft of the Declaration of Independence, one of the most stirring, democratic and egalitarian statements of the modern age. A year later, on July 4, 1777, Philadelphia marked Independence Day by adjourning Congress and celebrating with bonfires, bells and fireworks. However, while the Revolutionary War raged, July 4 celebrations were modest. But it was only in 1941 that Congress declared July 4th a federal holiday. The Declaration of Independence is a revolutionary document. Not only did it declare the thirteen colonies independence from the British Monarchy, but it challenged the accepted structures of inequality that had previously governed the affairs of mankind. The nation the Declaration inspired had no laws restricting immigration until the xennophobic Chinese Exclusion Act was passed in 1882. Only after WWI were quotas placed on immigrants from southern and eastern Europe. In the Twenty-First Century, undocumented workers who do our nation's hardest, most dangerous and dirtiest work have picked up where the Patriots and their descendants left off asserting that they too are human beings with rights denied. The wave of deportations being carried out today, over 350,000 people were expelled last year, are contrary to the spirit of the Declaration of Independence and the Founding Father's vision of a new, free nation of self- governing citizens. So as we celebrate this weekend take a moment to remember that two hundred and thirty foure years ago thirteen sparsely populated Atlantic outposts of farmers, servants, slaves and merchants declared that all men were created equal with inalienable rights. Since that day freedom loving people from Selma, Alabama to Warsaw, Poland from Tienanmen to Iran to Arizona have been inspired by the patriots’ declaration of and fight for political liberty. A month ago the Milwaukee Journal Sentinel ran a column by Sheldon Lubar arguing:" The Age of Austerity is also what lies ahead for all of us today, not our grandchildren. This is the painful reality." Putting aside the fact that tens of millions of working and middle class Americans, including the fifteen million who are unemployed and fifty million without health care insurance, have already been subject to the austerity of declining real wages, stagnate family incomes and soaring medical, education and real estate prices (until recently), Lubar is prescribing exactly the wrong medicine for what ails the U.S. economy. Krugman concludes:... the next time you hear serious-sounding people explaining the need for fiscal austerity, try to parse their argument. Almost surely, you’ll discover that what sounds like hardheaded realism actually rests on a foundation of fantasy, on the belief that invisible vigilantes will punish us if we’re bad and the confidence fairy will reward us if we’re good. And real-world policy — policy that will blight the lives of millions of working families — is being built on that foundation. Krugman's column is worth reading and is linked here. The Milwaukee Journal editorial Board also weighs in today with an editorial that explains why focusing on deficit reduction is not only wrong, but likely to undermine the recovery and revive the worst recession since the Great Depression.